It lasted all of an hour. This is in Garland on the way to work. 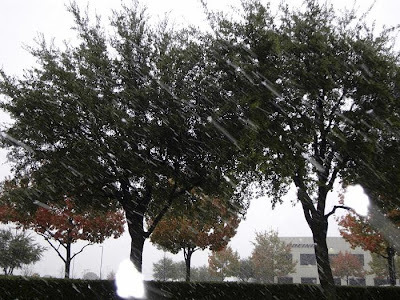 Cilla has a photo of the snow coming down in Terrell. Give her site a visit, she always has something going on. If you like music hop over to Show Me the Mom and play the you tube clip. I did, and got the song stuck in my head. Don't forget this Saturday at Memorial Stadium is the annual Terrell Police Services vs. Terrell Fire Department flag football game. Game time is 10am, admission is an unwrapped toy for boys and girls age 10 and up. Woody told me that I need to root for the Fire Department. Here are my week 13 NFL picks. Lets hope I do better than last week.